The Flash explosion suppression system is a flexible, modular system consisting of explosion detectors which are triggered by static pressure or an increase in pressure or optical monitoring such as UV, IR or UV/IR, or a combination of all of these depending on the customers process. 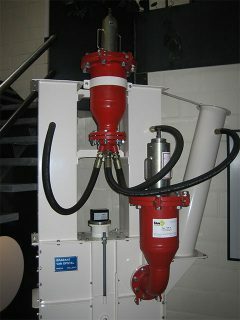 Also there will be a multifunctional modular control unit which will be coupled to ultra-fast powder extinguishers which, because of the fexibility that Flash provides, are available in different sizes and with various types of connection flanges depending on the application.This means that it is possible to assemble the most effective explosion suppression system available for that particular process or application. 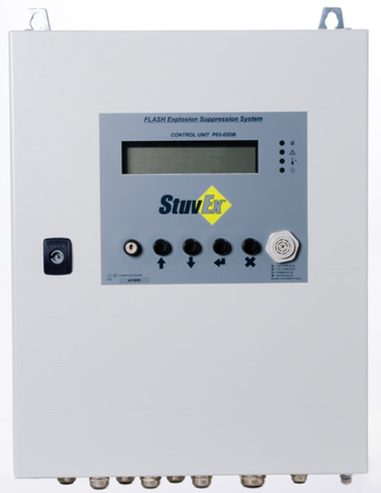 At the very heart of the Flash Suppression system is the control unit. The unit is equipped with a memory and a LCD screen and it controls and manages all the connected zones. The maximum number of zones that the unit can manage is sixteen which can be distributed throughout the plant by adding in extensions. Each extension can handle up to six zones. The main unit and its extensions are interconnected by means of a bus cable. CUP0302D-S: the simplest, stand-alone configuration for one zone only, typically used in simple stand-alone safety systems such as chemical barriers, fast-closing valves etc. CUP0302D-B: the basic configuration for more complex safety systems such as explosion suppression or when several simple systems must to be controlled/monitored from a central point. An explosion is nothing more complicated than the instant combustion of gas or dust mixed with air. Simple isn’t it. But it’s what happens next that the complications set in. At best, a wrecked machine and loss of production for as long as it takes to possibly repair or buy in a replacement machine; oh yes and then there will be the inevitable investigation by the H&SE.But far worst will be injury or loss of life to a member of the work force. The ramifications now will be far-reaching – court action, huge fines, possible closure of the factory but it need not have happened in the first place if a correctly installed explosion suppression system been installed. Flash is hugely effective at suppressing an explosion. A detector continuously monitors the process being protected. In the event of an increase in pressure or optical detection which ever detecting system is being used, the detector will send a signal to the control unit which in turn, triggers the gas generators of the extinguishing agent bottles. It takes milliseconds to flood the offending area with enough food-grade Sodium Bicarbonate to suppress the explosion before it has had a chance to take hold.The result is minimal damage to the process and as Sodium Bicarbonate is used as the suppressing agent cleaning is easy and, once the cause of the problem has been resolved, production can resume as before.The big advantage of the Flash system over other types of explosion suppression is that there is no need for pressure vessels as it is powered by gas generators with a life span of up to ten years. 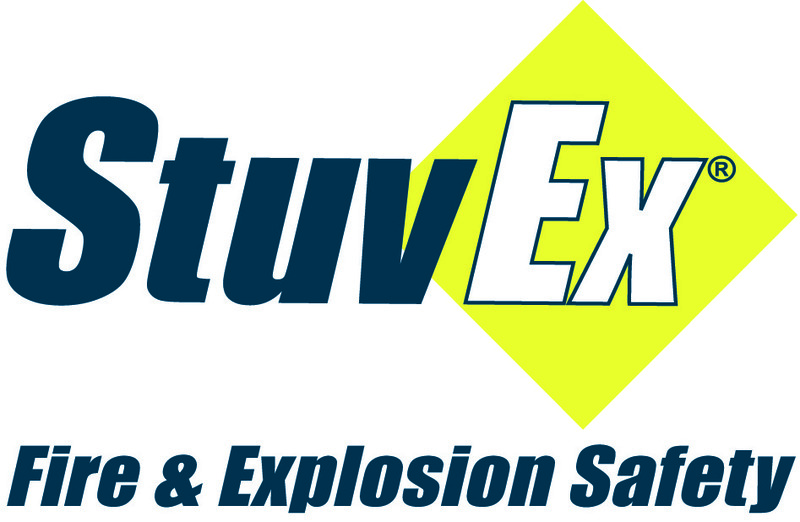 Also, the StuvEx designed communication protocol between the various components, makes a system fault due to EMC radiation on the wiring practically impossible and because of the modular nature of Flash installation, operating and maintenance costs can be easily budgeted for.